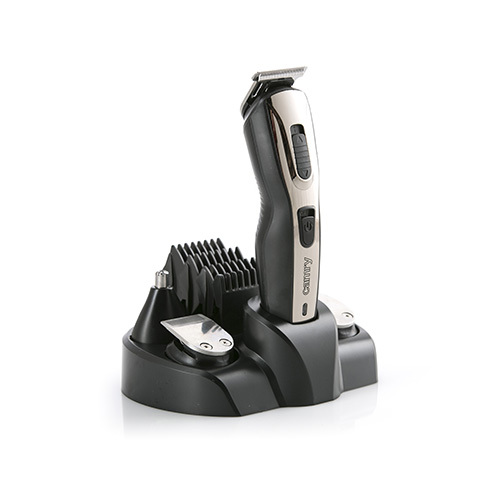 The CR 2921 combines a clipper, shaver and trimmer. 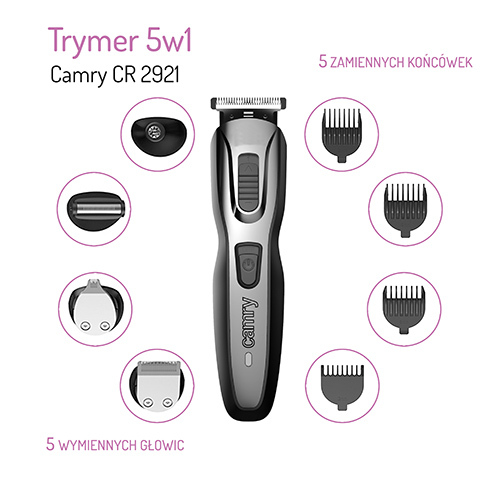 Multifunctionality and exceptional practicality of the device were obtained thanks to five interchangeable heads and 5 blades attachments. Thanks to them, there is no need to buy more clippers. The entire set can be conveniently stored in a stand suitable for this purpose, at the same time acting as a charger for the built-in battery. The maximum power of the device is 48W. 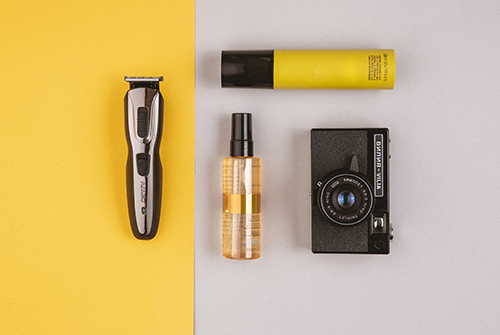 Are you looking for a product that will allow you to take care of your haircut? You do not have time for long and expensive visits to the hairdresser? 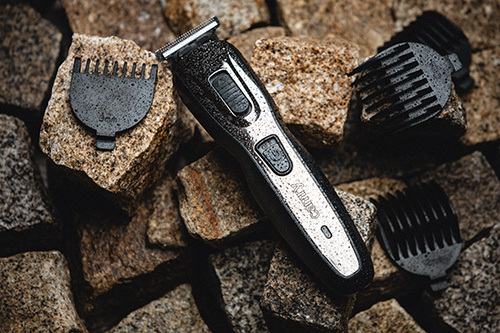 Are you looking for a professional device that will help you quickly shave, easily shorten your hair or take care of your beard? You do not have to look any further! Hair Trimmer 5 in 1 CAMRY CR 2921 is a professional and economical solution. 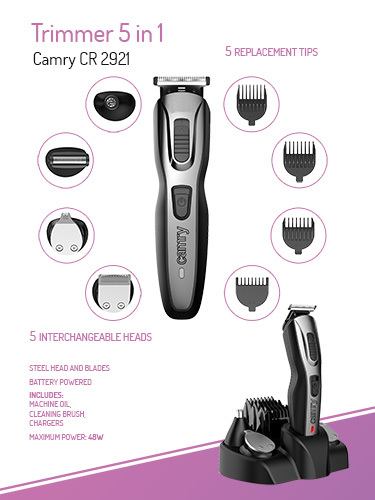 The ergonomic shape ensures the comfort of use, and the combination of razor, shaver and trimmer ensures functionality. From today, your haircut will only take a few moments! 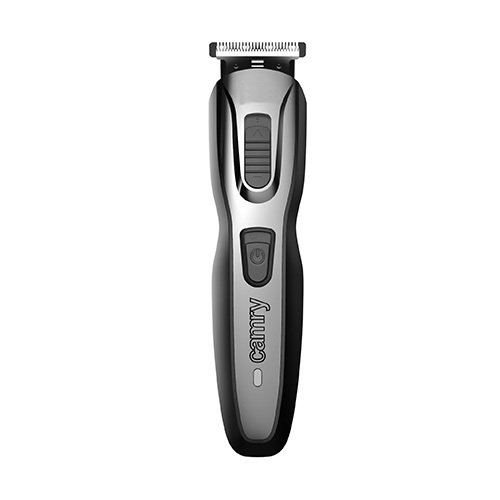 Trimmer CAMRY CR 2921 is an easy-to-use device, which fits perfectly in your hand and provides a perfect and fast haircut. The interesting design and functionality are important but not the only benefits of this device. The advantage of our product over others on the market is the practicality of the device. It could be possible thanks to 5 interchangeable heads and 5 capes for blades. Thanks to them, you can experiment with the length of your hair and you do not need any more tools. Thanks to a few simple movements you can enjoy a comfortable and stylish haircut adjusted to your style and current season. It is also an ideal product for all bearded men! 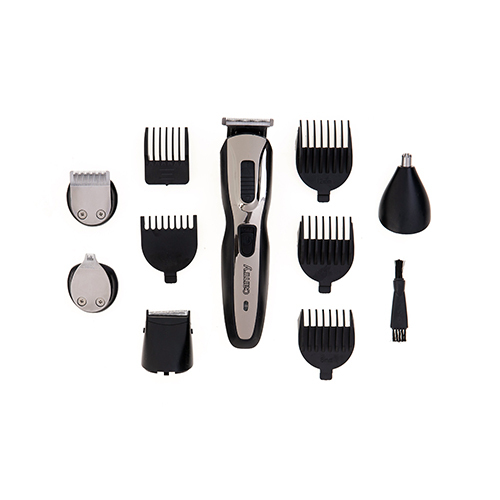 Different lengths of combs and a steel finish will also help to take care of your facial hair! Maximum power of the device is up to 48W. 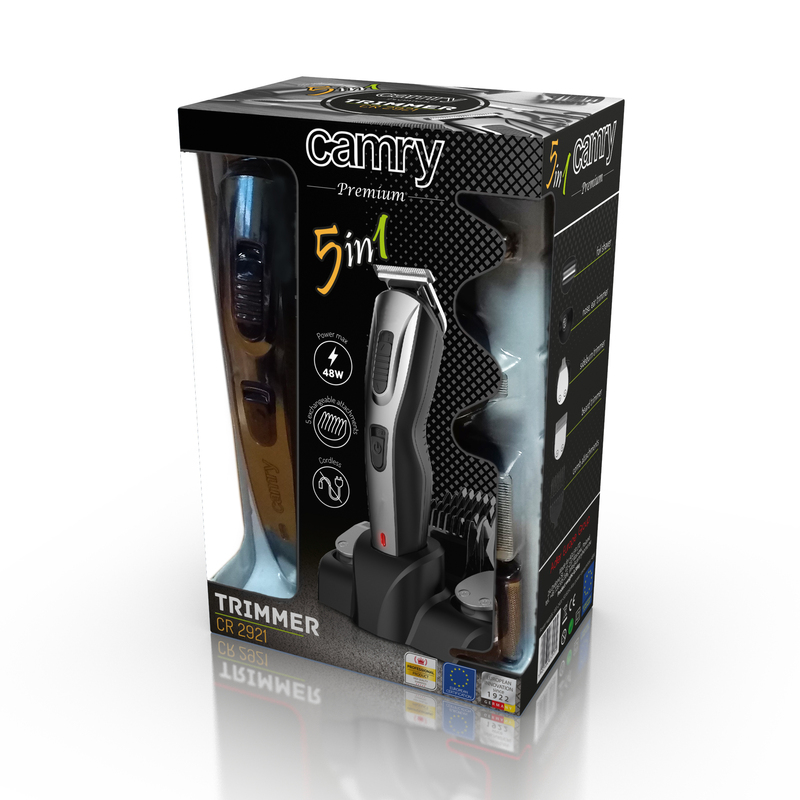 The cordless power supply allows you to safely use the trimmer in different situations, including when travelling. What does it mean? Convenience! Before using just charge the battery by connecting the power cord with the outlet. When choosing our products, you always select high quality. In the set beside the power supply, heads and blades you will also find oil and a brush to clean the device. Thanks to such additions, you can ensure long-term use of the product, cleaning and preserving it when necessary. The brush will help to clean the head from the shortest hair. A few drops of oil will ensure trouble-free operation of heads and blades. In addition, the whole set can easily be stored in a stand suitable for this purpose, which is also a charger. It will not take much space in the bathroom and will provide quick access to the device. We do recommend it!